On Wednesdays I have lunch with the boys and we solve the world's problems over barbecue. Today, despite the distracting hullabaloo over the new Russian edition of Virus of the Mind, we solved the sticky problem of the "Death Panel":: who decides when to pull the plug on a terminal patient? Studies show that 27% of Medicare dollars are used in the last year of life. At some point, someone has to decide how much to spend on expensive treatment and maintenance at the end of life. Fearmongers in Congress have referred to this necessary evil as a "death panel." Who will be on these death panels? What criteria will they use? Will some people be considered more worthy than others? These are really tough questions. We decided it's much more civilized to have the patient decide. And we have the perfect model for the decision-making process on TV every week: Deal or No Deal. The insurance company has actuarial tables that will tell them, on average, how much it will cost to do everything medically possible to prolong the patient's life. So all they have to do is offer a fraction of that to the patient, to pass on to the family, in exchange for pulling the plug. $275,000: Deal or no deal? This month on HayHouseRadio.com, I’ll be participating in the new Heal Your Life Online Course, featuring world-renowned experts in the fields of inspiration, health, nutrition, personal growth, and divine guidance, who will share their insights on how you can transform your life—both inside and out. I hope you’ll join us! I am proud to share my event on April 1st, which is just one of eight FREE live online seminars that will be offered throughout the month of March! This special Heal Your Life Online Course features free lessons from more of your favorite authors: angel expert Doreen Virtue, empowering storyteller Alan Cohen, #1 weight-loss specialist Jorge Cruise, spirit whisperer John Holland, celebrity skin expert Kate Somerville, beloved teacher and author Louise Hay, and "Father of Inspiration" Wayne Dyer. To sign up for this FREE spectacular Heal Your life Online Course, click here. The series runs from March 9 to April 1, and space is limited. Do you ever wish there was a spa for your body, mind, and spirit? A place where you could go to relax, recharge, and reconnect? Now there is: HealYourLife.com! Much-loved author and teacher Louise Hay wanted to build a Website where you could feel at home, find comfort, and leave your troubles and negative thoughts behind. Welcome to HealYourLife.com, a free multimedia Website—rich with content that will soothe your body, awaken your mind, and revive your spirit with encouraging words and powerful wisdom, from Louise and all of your favorite authors. Whatever time of day, whatever mood you’re in, whatever struggles you’re facing, whatever questions you’re trying to answer, we’re here for you 24/7—a family of authors, experts, and like-minded friends who will listen and share their expertise and experiences with you — and the best part — it's all FREE! COME TO HEALYOURLIFE.COM TODAY and read my latest article, Life’s Little Training Wheels: Getting past beliefs that work against you. Plus, you’ll meet the world’s hottest best-selling self-help authors; the leading intuitive, health, and success experts; up-and-coming inspirational writers; and new like-minded friends who will share their insights, experiences, personal stories, and wisdom so you can heal your life and the world around you . . . one thought at a time. Click here to get started. 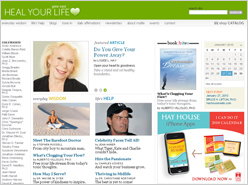 Watch a video clip of Louise Hay introducing you to the benefits of HealYourLife.com: click here. Both of my self-help books are now available in their new Hay House editions for print and Kindle. Virus of the Mind is also available in audio, although it's heavily abridged. I changed the subtitle of Getting Past OK. It's now The Self-Help Book for People Who Don't Need Help. I don't have a lot of seamy underblog stories now that I've found true love, but now that I finally got the blog ported over to Blogger I may post more frequently. I've also finally added the photos to the Johnny Chan entry. Enjoy. This blog is now located at http://qlbrodie.blogspot.com/.